There are advantages to being less well-known in the wine world. There are fewer expectations so you can focus on what you want to do rather than what is conventional or popular. There is no basis for pretension so being down-to-earth is second nature and there are lots of incentives to be welcoming to anyone who takes an interest in what you do. 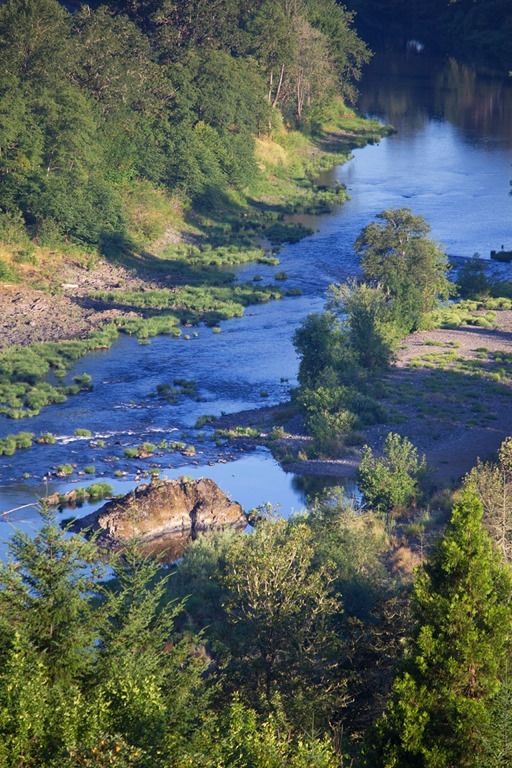 That innovative spirit and welcoming attitude are on display in Oregon’s Umpqua Valley. 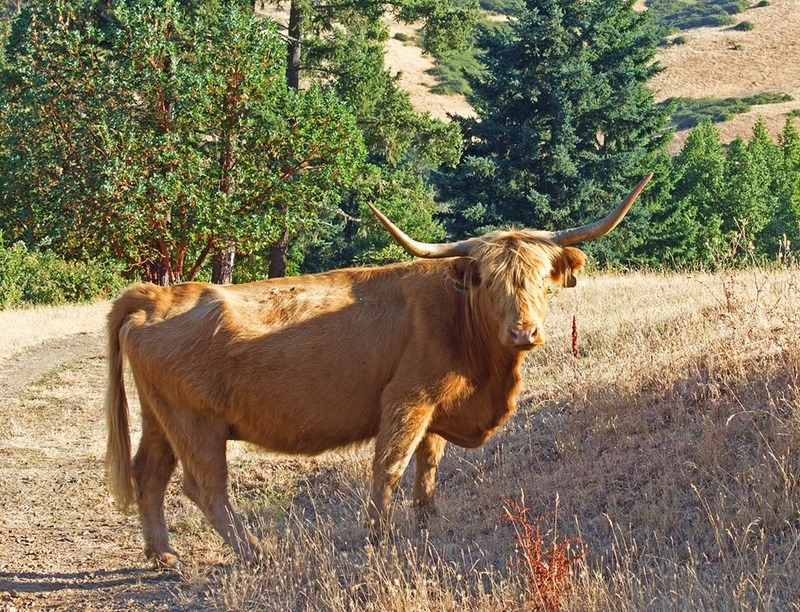 Even the bulls were friendly in Umpqua. The Umpqua Valley AVA is part of the Southern Oregon AVA which also includes the Rogue Valley. I wrote about the Rogue Valley recently and much of what I said about the Rogue holds true of Umpqua. Most of this AVA (excluding Elkton) has a semi-continental climate with significant rainfall in the winter but hot, dry summers. It’s warm enough to get most varietals ripe, but the growing season is relatively short due to late spring frost and early autumn rains so varietals that ripen quickly do best. Also on the plus side, the mountainous topology creates a wealth of microclimates for winemakers to play in. However, Umpqua has unique characteristics that make it worthy of its own post. It is smaller in terms of area under vine than the Rogue—2856 harvested acres in 2015 vs. Umpqua’s 2443. But there are many fewer wineries—50 in the 3 Rogue Valley sub-regions vs. 27 in Umpqua and Elkton. Because Umpqua Valley is roughly 100 miles north of the Rogue Valley it gets a bit more rain and more marine influence and so temperatures are more moderate than in Rogue Valley. The culture of the Rogue Valley is influenced by the popularity of Ashland as a tourist destination. Umpqua, although a gateway to some great hiking and camping in the nearby mountains, is anchored by the smaller, less tourist-centric town of Roseburg, for years a logging town until the wineries arrived. Rural and untamed but gracious and civilized describes Umpqua Valley—its wines and its people. At the north end of the valley, especially in the Elkton area which is now a distinct AVA within Umpqua Valley, vineyards are only about 25 miles from the coast and thus enjoy significant marine influence and about 50 inches of rain per year, helping cool climate varietals such as Pinot Noir and Gewurztraminer to flourish. The area northwest of Roseburg is higher in elevation at about 1400 feet and has a warmer, drier climate with about 33 inches of rain per year. Thus, a mix of cool and warm climate varietals will thrive including Cabernet Franc and Merlot. The area south of Roseburg is even warmer and more arid, similar to Rogue and Applegate Valleys, making irrigation necessary. Warm-climate varieties, including Tempranillo and Syrah thrive in the South. Unlike the Rogue Valley, the vine louse phylloxera has a presence so most vineyards use resistant rootstock. 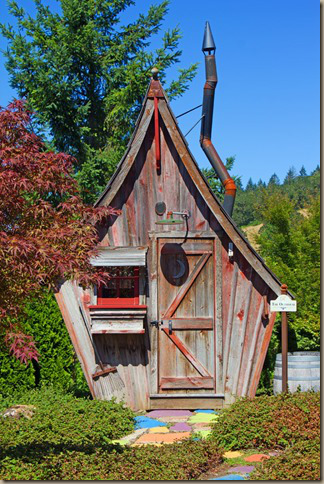 LIke all wine regions, Umpqua Valley has some great stories. Against all advice, a young horticulture student Richard Sommer first introduced vitis vinifera to Oregon in 1961, planting Pinot Noir and Riesling on an old turkey farm near Roseburg. He later established Hillcrest Vineyard, the state’s oldest continuously operating winery, thus launching the modern Oregon wine industry. That legacy of innovation is now carried on by Dyson and Susan Demara who purchased Hillcrest in 2003. Dyson has been in the wine business all his adult life having made wines for Mondavi in Napa and Wiengut Heinz Schmitt in Germany’s Mosel, among others. From his patented fermenters, dry-farmed vineyards to 30-60 day skin contact on some of his red wines, Dyson continues to chart his own path in the spirit of Richard Sommers. As Dyson told me “Umpqua is a land of individuals” . That about sums up this region. Again, against the advice of people who claimed to know, Earl and Hilda Jones, owners of Abacela winery, although lacking any winemaking experience, came to Umpqua in 1994 specifically to test the hypothesis that Tempranillo can be grown here. That hypothesis has been confirmed over and over. According to some, Tempranillo is now destined to become Southern Oregon’s signature grape, and Abacela has turned their attention to proving Albarino can flourish here as well. Another regional innovator Reustle-Prayer Rock Vineyards, Northwest Winery of the year according to Winepress Northwest magazine, was the first U.S. Vineyard to plant the Austrian varietal Grüner Veltliner in 2003. They now make several stunningly successful cuvees of this grape including a reserve and a smaragd-style sweet wine. A few years ago Dyson Demara invited his old friend Scott Kelley, whom he met while working at Mondavi, to come to Roseburg to make wine. The result is their joint project, Paul O’Brien Winery, an urban winery sitting on a busy intersection in downtown Roseburg. Dyson and Scott are unique because of their experience. Most winemakers in emerging wine regions got their start in another occupation and gravitated toward the wine business only after becoming established elsewhere. By contrast, Dyson and Scott have been at it their whole adult lives making wine all over the world. With those contacts they could have put down roots anyplace but cast their fate with Umpqua largely because of that freedom to be themselves (along with ideal weather, good soils, and cheap land). All that worldly winemaking experience combined with the successful pioneering legacy already in place here is helping the Umpqua Valley achieve their aim of producing world class wines. Situated on Interstate 5, the main north/south corridor in the Pacific Northwest and with lots of inexpensive grape-friendly land to entice winemakers fleeing the expensive, crowded regions to the north and south, Umpqua is a region to watch. As expected of a town of just over 22,000 people, dining options in Roseburg are limited but promising. The Parrot House, a fine-dining option housed in an attractive, renovated historical building has been open for a year and will satisfy wine lovers’ cravings for contemporary American cuisine with a European twist. The Calabrian-style meatballs served over grits and a sun dried tomato sauce were delicious, as was the “whole hog”, pork shoulder, grilled pork loin and pork belly served over polenta. True Kitchen is a more casual contemporary American option with a modern vibe, interesting menu and well-designed dishes although the execution was problematic on the night we visited. And if you’re heading into wine country northwest of Roseburg don’t miss the Lighthouse Bakery. Wonderful breads, homemade soups, and vegetarian cuisine that will make you forget about meat rule here. Even carnivores will love their Rueben made with tofurky. No, it isn’t authentic but it’s only modestly hyperbolic to say it’s as good as it gets west of New York. The earliest Tempranillo pioneer in Southern Oregon and winner of many awards, this long established winery is the largest producer we visited with an annual case production of 12,000. Their several bottlings of Tempranillo are very good (see my review of their 2013 Barrel Select here). The Albarino, Syrah and Malbec are all excellent. But I was most intrigued by their Graciano (a Spanish varietal seldom seen as a stand alone bottling) and a beast-like, soul-stirring Tannat that needs time to soften but will provide much satisfaction. Abacela is well-established but are not resting on their laurels, always pushing the envelope with new varietals showing the versatility that defines Southern Oregon. As noted above, this is Oregon’s oldest continuously operating winery now owned by Dyson and Susan Demara. One of the attractions is Dyson’s outsize personality matched only by his robust wines, the result of his many decades in the wine business. There are lots of unusual bottlings here (see my review of his Umpqua Ribera Tempranillo and his Bull’s Blood) but the whole lineup is interesting and delicious. Dyson takes great pride in making wine using very traditional methods but of course supplemented by his comprehensive knowledge of modern winemaking and ceaseless striving for originality. Lovely Pinot Noir, Riesling, Cabernet Sauvignon, and Tempranillo plus a variety of interesting blends, and a gorgeous Tawny Port just scratch the surface here. Wines that Dyson makes in Germany and Spain are also available in the tasting room. Co-owned by Dyson Demara and Scott Kelley who met while both were working at Robert Mondavi, this is an urban winery housed in the building of an old Chevy dealer. Sourcing grapes from local vineyards, Scott Kelly makes very modern-style wines with lots of polish and fruit power (see my review of his Cask 11 Tempranillo and his skin contact Riesling .) The Sangiovese, Syrah and Tempranillo marry elegance and power, while several Pinot Noir cuvees show classic velvet textures and intense aromatics. The white wines are equally compelling—a scintillating bone-Riesling, Gewurztraminer, a food-friendly Pinot Blanc/Chardonnay blend in addition to that outstanding skin-contact Riesling. The oldest continuously owned winery in Southern Oregon, Girardet was founded by Swiss rocket scientist Philippe Girardet in 1971 who toured the U.S. in a Volkswagon bus with his wife Bonnie to fine cuttings for their new vineyard. Philippe has turned winemaking duties over to his son Marc but he can still be found regaling customers in the tasting room with stories about his family’s tradition of making wine in Switzerland. Bush-trained vines and varietals seldom found in Southern Oregon such as Baco Noir, Seyval Blanc, and Marchal Foch are among the charms of this small production farmhouse winery. The Baco Noir was a revelation, but their conventional varietals including Riesling, Sangiovese, and Tempranillo were wonderful as well. Rustic wines but with lots of flavor and personality. Lovely views and a charming, whimsical winery atmosphere welcome visitors to Reustle. The tasting presentation was designed to highlight this charm. Tasting flights were served while patrons are seated on the patio overlooking the valley and accompanied by well conceived food pairings. We were able to taste their Rosé, their flagship Gruner Veltliner of which they were the first in the U.S. to plant in 2003, a Pinot Noir, and Malbec. All were top notch. The Pinot Noir was among the best we tasted in Southern Oregon and the Malbec was certainly the best. Their several signature Gruner Veltliner bottlings deserve the many accolades they have received. (See my review of their Gruner Veltliner Reserve here.) They bottle 12 varietals from all estate-grown grapes. A bit of an outlier in this group because they source a lot of fruit from the Rogue Valley, tasting through their lineup shows why. These are big, bold wines that require the warmer weather in the south to get the grapes sufficiently ripe for this style. The spicy, smoky Cabernet Franc, the Bordeaux-style blend called Claret, and the Cabernet Sauvignon were highly extracted and richly oaked. The Tempranillo, Malbec and estate Syrah were slightly more reserved but still full of flavor. Petite Verdot, Dolcetto, Petite Sirah and Alicante Bouchet (from California’s Amador County) round out the lineup. The Dolcetto was especially noteworthy. In Italy this grape often makes a thin, forgettable table wine. Spangler’s version is rich with mint and earth notes supplementing the fruit. For these wines, sufficient age is essential and many of these wines are given extensive barrel and bottle age prior to release. The highly acclaimed Brandborg Vineyard and Winery makes several outstanding, spicy, silky Pinot Noirs including a pretty, floral white Pinot Noir. But for me the show stopper was their gorgeous, richly aromatic 2013 Gewurztraminer. Riesling, Pinot Gris, and Sauvignon Blanc round out the whites. Sangiovese, Syrah, and surprisingly a Gamay were the additional reds available. But really you come to Brandborg for the Pinot Noir and Gewurztraminer. Elkton also features Bradley Vineyards, a small, farm winery featuring 100% estate grown fruit from vineyards first planted in 1983. Their Pinot Noir is excellent but especially noteworthy was a skin-contact Gewurztraminer called L’Orange and an outstanding Reserve Baco Noir 2015. This grape, a hybrid of the French grape Folle Blanche and an unknown North American varietal is rich and full bodied with meat and caramel on the nose but very soft tannins. The hybrids can be a challenge for those of us raised on vitis vinifera but Baco Noir has great potential. Posted on Edible Arts on 7/27/2017.